Our Year 6 Pupils took a trip back in time to experience a WW2 ‘Evacuee Day’ at Brackenhurst last week. During the trip, which is related to our current learning question ‘Why was Britain Under Threat in 1939?’ pupils had the opportunity to extend and develop their knowledge of the period and the process of evacuation. As such, the class experienced what it was like to be evacuated and to be billeted around the village as well as having the opportunity to delve into some suitcases of the era and get to grips with primary resources to ascertain who they might have belonged to. Alongside undertaking impromptu marching drills, the class had the opportunity to visit an Anderson Shelter and experience a bombing raid whilst also making their own plant pots, digging for victory in the gardens before completing a treasure hunt solving clues to find a mystery spy on the estate. 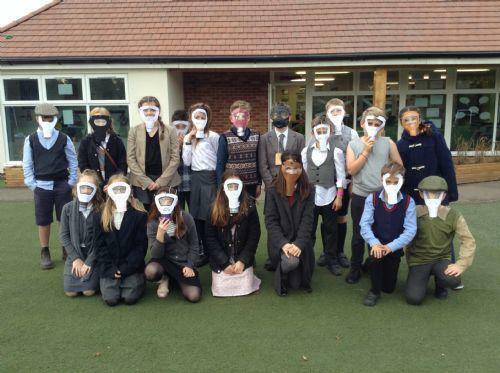 The class, who clearly enjoyed the day, really entered into the spirit of the era getting dressed up in evacuee attire and making gas masks ready for any unexpected attacks!